Lots of people left the line in April. The US unemployment rate dipped to 3.9% in April, after hovering at 4.1% for the last six months. That’s the lowest it’s been in 18 years. This would seem to be a sign of improving prospects for US workers—if not for a couple of wrinkles. First off, there’s the reason unemployment dropped: Because Americans are dropping out of the workforce, as opposed to an increase in the number of workers with jobs, as Dean Baker, economist at the Center for Economic and Policy Research, points out. Rather than adding workers, the American labor force shed 236,000 people between March and April. Labor force participation, which measures the share of the working-age population that is either employed or looking for work, actually ticked down for the second month in a row. 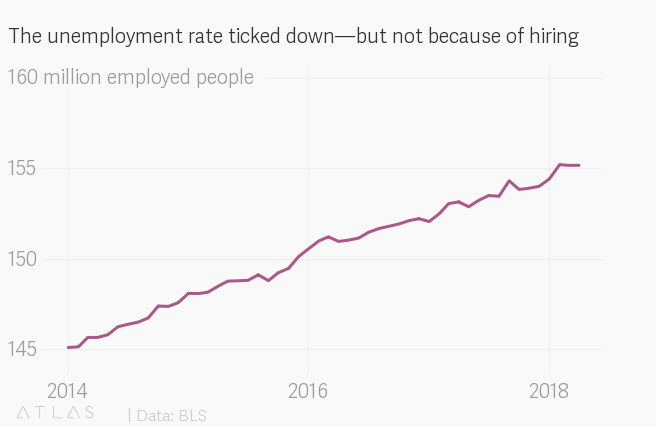 This signals that there’s more slack in the US labor market than the unemployment rate indicates. There’s also scanty evidence that paycheck growth is accelerating; the average hourly wage rose a mere $0.04 in April. And the share of people unemployed because they voluntarily quit their jobs is still considerably less than it was in 2000, the last time the unemployment rate hit 3.9%. People tend to be willing to leave their jobs when they’re sure they can easily find another. 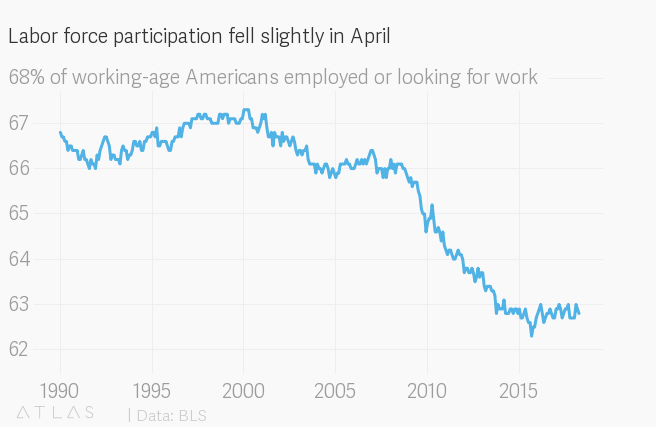 In April, around 12.7% of unemployed Americans had voluntarily quit, as opposed to 14% or more back in 2000. “This suggests that, in spite of the low unemployment rate, workers are still not confident about their labor market prospects,” writes Baker. Things weren’t all bad, though. The U-6 measure of unemployment—which, in addition to those without jobs, includes workers who want to work but have quit looking, and part-time workers who want full-time gigs—hit 7.8%, a 17-year low. That hints that “the pool of available labor helping to keep a lid on inflation is slowly drying up,” says Capital Economics in a note, flagging that an index of employment costs also continued to climb. Signs of labor market tightening are likely to spur the Federal Reserve to continue to raise the federal funds rate in June, in a bid to head off inflation. In turn, higher rates could provoke a stock market selloff. That means May’s employment report will be even more closely watched than this month’s.